They’ve got quite a racket going. First, they get to name anyone they don’t like ‘Nazis’. Then they play the ‘hero’ for ‘opposing’ their ‘Nazi oppressors’. 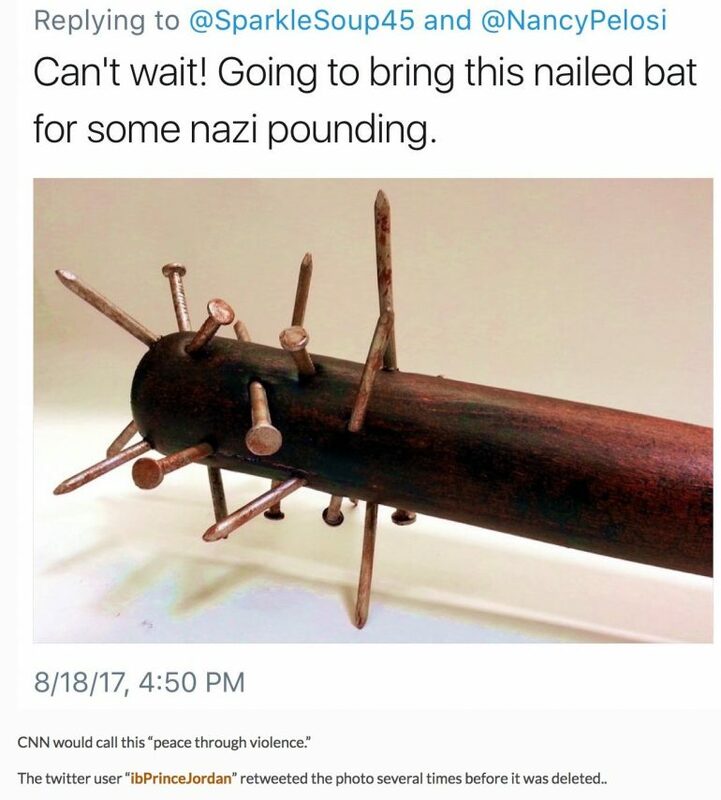 It’s an open threat of violence. And who did he see fit to share it with? Will she finally be forcefully denouncing Antifa now? He’s planning to target a Prayer Rally. Has she any decency? Here’s what we’re facing. The right thing would have been to notify the police about the threat of violence. We certainly hope she did, and we also demand she denounce the violence people connected to and voting for your party harbor. Political thuggery has no place in a Free Nation. For all her rhetoric, the denunciation of statues, and her overheated reaction to what’s left of that Democrat legacy movement — the KKK — we are still waiting for her to denounce Antifa. Why the delay? Is she secretly cheering their anti-American activitites? We call upon her to denounce BY NAME — in strong and clear terms — All Leftist riotous groups who intend to harm, maim, or kill random bystanders they have decided to call ‘Nazis’. In this case… the thug is targeting a Prayer rally. Hey Nancy. For all your Social Justice bluster, we’re calling Bullsh-t, right here and now. Since you like throwing accusations around so very much, let’s turn the mirror back on you. You and your party are deeply indebted to an honest-to-God Nazi Collaborator. Not just ANY Nazi Collaborator, but an unrepentant one who PERSONALLY dispossessed condemned Jews. That looks a lot more like ‘literally Hitler’ than anything she’s accusing the Right of doing. We can say this because he HIMSELF said as much when interviewed on 60 Minutes. He is also the Left’s BIGGEST Sugar Daddy. We expect you will all do the right thing, and denounce both Antifa (who get at least some of their funding from Soros-connected groups) AND denounce George Soros. Of course, you can demonstrate your sincerity by returning any money he gave you, and refuse to take money from him, or his proxies ever again, lest you be tainted by them. Will The AltLeft Attack The Dixie Chicks For Their ‘Racist’ Name?